This article is about the city. For the Saudi Aramco residential compound, see Saudi Aramco Residential Camp in Dhahran. 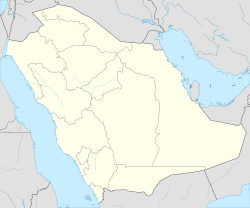 Dhahran (Arabic الظهران aẓ-Ẓahrān) is a city located in Eastern Province, Saudi Arabia. It is a major administrative center for the Saudi oil industry. Together with the nearby cities of Dammam and Khobar, Dhahran forms part of the Dammam Metropolitan Area, which is commonly known as greater Dammam and has an estimated population of 4,140,000 as of 2012. Large oil reserves were first identified in the Dhahran area in 1931, and in 1935, Standard Oil drilled the first commercially viable oil well. Standard Oil later established a subsidiary in Saudi Arabia called the Arabian American Oil Company (ARAMCO), now fully owned by the Saudi government and known as Saudi Aramco. Dhahran has been the home of Saudi Aramco's headquarters for 80 years and is its first and largest gated compound with more than 50,000 residents. Employees and dependents of Aramco, known as Aramcons, have a tendency to use Dhahran to solely refer to the Aramco camp while using Khobar and/or Dammam to refer to the area outside the camp. The Saudi Aramco Residential Camp makes up much of the city of Dhahran today. Home to Mall of Dhahran one of the biggest shopping complexes in the Eastern Province. Dhahran is a short distance west of downtown Khobar. It is about 15 kilometres (9.3 mi) south of Dammam. Both are older Saudi port cities on the coast of the Persian Gulf. Looking farther afield, Dhahran is northeast of Abqaiq, and southeast of Qatif and, further north, Ras Tanura, a major oil port. The Kingdom of Bahrain is also within easy driving distance to the east (about 32 km [20 mi]), across the King Fahd Causeway, from Khobar. There are several notable landmarks in Dhahran City including KFUPM clock tower as well as Saudi Aramco's Al-Midra Tower and King Abdulaziz Center for World Culture. However, the tallest buildings in Dhahran are currently the new Al-Othman twin towers which are located in the north east of the city facing Al-Khobar. The patch of desert on which the city is built is hilly and rocky, and most of the earliest productive oil wells in Saudi Arabia were drilled in the area, such as Dammam Well No. 7: "Prosperity Well", the first commercially viable oil well in Saudi Arabia in the 1930s. This well was still in production 70 years later. This later led to the selection of two barren nearby hills as the place for Aramco to construct its headquarters. The Dhahran-Dammam area is one of two regions, the other being Jeddah, that were selected as potential sites to build the first Saudi nuclear reactor. Dhahran has a hot desert climate (Köppen: BWh), featuring summers among the hottest and most humid in the world, and virtually frost-free winters. Temperatures can rise to more than 40 °C (104 °F) in the summer, coupled with high humidity , given the city’s proximity to the Persian Gulf. The highest recorded temperature in Dhahran is 51.1 °C (124.0 °F). In winter, the temperature rarely falls below −2 °C (28 °F), with the lowest ever recorded being −5 °C (23 °F) in January 1964. Rain falls almost exclusively between the months of November and May. The Shamal winds usually blow across the city in the early months of the summer, bringing dust storms that can reduce visibility to a few metres. These winds can last for up to six months. It has been reported that on July 8, 2003, the dew point was 35 °C (95 °F) while the temperature was 42 °C (108 °F), which would indicate a heat index of 79 °C (174 °F), one of the highest heat indexes ever reported. Dhahran was settled after 1938, the year oil was discovered in the vicinity. During World War II on 19 October 1940 Dhahran was struck by Italian Royal Air Force (Regia Aeronautica) as a part of Bombing of Bahrain, causing little damage. In 1944, the United States was authorized to build an air base in Dhahran. Construction began in 1945 and was completed in 1946. The base was turned over to the Saudis when its lease expired in the early 1960s. In 1950 Dhahran had a population of about 7,000 people. During the Gulf War, the city was the scene of the largest loss of life among coalition forces. On February 25, 1991, an Iraqi Al-Hussein missile#Persian Gulf War (1991) hit a U.S. Army barracks in the city, killing 28 American reservists from Pennsylvania. Eighty-seven years on, Dhahran is still Saudi Aramco's worldwide headquarters and the center of the company's finance, exploration, engineering, drilling services, medical services, materials supply and other company organisations. The population of Dhahran is mainly Saudi, but also includes many expatriates from Asian countries, such as Bangladesh, India, Indonesia, Nepal, Pakistan and the Philippines, as well as countries such as the United States, Canada, European countries, Turkey, South Africa, Australia and New Zealand. There are also many non-Saudi Arab nationals living in Dhahran, such as Egyptians, Jordanians, Lebanese, Palestinians, Sudanese, and Syrians. The 1993 population of the city was 73,691. According to a 2004 census the total population of the Dhahran municipality is 97,446. Many companies that employ relatively large numbers of expatriates have built fenced-in compounds where only expatriates live, however the largest compound, the Saudi Aramco Residential Camp in Dhahran provides accommodation to many different nationalities. Although built originally to house only expatriate oil company employees (mainly Americans) to provide a degree of Western comfort and separation from the restrictions of Saudi and Islamic laws, the community today has shifted somewhat in line with the reduction of western residents into a multi-ethnic mosaic of Saudis, other Arab nationalities (e.g., Egyptian and Jordanian), Asians, Europeans, South Americans, Africans and Australians. While only employees of Saudi Aramco live on the camp, their nationalities reflect those of the company as a whole. There are also several neighborhoods, or suburbs just outside the main Saudi Aramco Camp, such as Doha District (حي الدوحه) Dana District (حي الدانة) and Aljamiah District (حي الجامعة), where Saudi Aramco gives home loans to Saudi employees to build their own homes. Dhahran is unique in a way that majority of the population live inside gated communities, whether built by Saudi Aramco, KFUPM or military. Dhahran is part of the Eastern Province, the largest province in Saudi Arabia. The province is governed by Prince Saud bin Nayef bin Abdulaziz Al Saud. Just like the rest of the country, the law of Shari’a, or Islamic law is adhered to. Following the Saudi Arabian municipal elections in 2005, members of the municipal councils were elected. Dhahran is guarded as it is a high visibility city. The Saudi Special Emergency Forces' Eastern Province headquarters are located in Dhahran near the Saudi Aramco residential camp. There are many security checkpoints throughout the city that have been almost permanently in place since the Riyadh Compound Bombings. The first American consulate was opened in Dhahran in 1944. As the centre of the nation's oil industry, Dhahran enjoys good transport resources both nationally and internationally, especially after the extensive modernisation of the nations highway infrastructure in the 1970s and 1980s. The extensive highway network in the Dhahran, Khobar, Dammam area serves the strategically important national oil industry, led by Saudi Aramco, as well as the local population. However, car ownership in the Kingdom has soared which often leaves non-highway roads congested at peak times. Formerly one of Saudi Arabia's three major international airports, Dhahran Airport (DHA), which opened in 1946 as Dhahran Airfield, is now a Royal Saudi Air Force air-base. Today, King Fahad International Airport (DMM), which replaced Dhahran International for commercial, private and cargo, serves the entire Metropolitan Area of Dhahran, Dammam, and Khobar, the distance to the airport terminal is about 40 km (25 mi) from Dhahran. Saudi Aramco Aviation operates its own terminal near King Fahd International Airport, where all Saudi Aramco flights originate. Although rail service in Saudi Arabia plays a much more minor role today than 50 years ago, an industrial railroad with a station adjacent to Dhahran still exists, linking it to the capital Riyadh. Public transport buses are only available in a very limited manner, with Taxi services, at reasonable prices and widely available, proving more popular. Large companies such as Saudi Aramco run their own bus transport operations, connecting residential and industrial camps of the company with Dhahran, Dammam, and Khobar. Many smaller residential compounds also operate their own bus services which are typically used for transport to places of work or shopping trips by residents. Mobile telephone communications are provided mainly by STC, Mobily and Zain, which have launched 3G and 4G services to their customers. STC also provides landlines through its Al-Hatif services, as well as providing internet services through Saudi Data. There are several Internet Service Providers such as Al-Alamiah, ArabNet, Nesma and others. Both DSL and FTTH services are available. There are several popular radio stations, such as Radio Sawa, Studio One 91.4 FM, broadcast from Aramco, and Bahrain Radio 96.5 FM. Satellite television is predominant in the market, with Orbit Showtime being the most popular, as well as the widespread Arabsat and Nilesat satellite channel operators. Schools in Dhahran come under two sections: public (government-run) and private. Public schools (K-12), open to almost everyone, strictly adhere to teaching the curriculum exactly as provided by the Ministry of Education. Public schools also come under two sections: Saudi Aramco built and government built. The Saudi Aramco built schools are usually better in design and last longer due to their being built to higher standards, however they are not operated by the company. Private schools also teach the ministry’s curriculum, but they have more flexibility often enhancing certain aspects, such as exceeding the ministry’s curriculum when teaching the English language and computer applications. University Schools, located within King Fahd University of Petroleum and Minerals, and Dhahran Ahliyyah Schools are examples of top private schools across Saudi Arabia are based in Dhahran. There are several schools that teach the curriculum of their native countries, such as the Multinational School Dhahran (MNS DhahranMultinational School Dhahran (MNS Dahran)}Pakistan International School, International Indian School, [http://www.dhahranbritish.com/ Dhahran British Grammar School, Dhahran Elementary Middle School, Dhahran High School. Dhahran High School (formerly Dhahran Academy High School) is a part of International Schools Group and is primarily composed of expatriates including American, British, Lebanese, Filipino, and Indian students. There have been Saudi students as well, though this is relatively rare. Advanced Placement courses have been available since Dhahran High School's first graduating class in 2001. The Dhahran School and the Dhahran Hills School are Saudi Aramco-run American curriculum schools within the Saudi Aramco Residential Camp. These schools are strictly only for the children of expatriate Saudi Aramco employees but are provided completely free of charge to them. They are fully accredited and are part of the larger Saudi Aramco Schools district, encompassing all Saudi Aramco-operated schools within Aramco residential compounds. 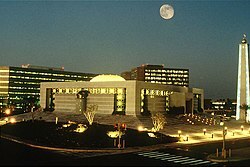 Dhahran is also home to the world-renowned King Fahd University of Petroleum and Minerals (KFUPM), and the Aramco Training Center (ATC), where many new employees of Saudi Aramco learn useful skills, such as English, business mathematics, physics, and computer skills. Imam Abdulrahman Bin Faisal University and Prince Mohammad bin Fahd University are also located near and within the city respectively. In 1998, after the kidnapping and murder of Matthew Shepard, a Wyoming college student, the major American news networks would occasionally mention that the student's parents lived in Dhahran and worked for Aramco. In Abdelrahman Munif's Cities of Salt novels, the oil-company outpost of Harran is widely believed to be Dhahran's fictional analogue. ^ "Extreme Temperatures Around the World". Retrieved 1 February 2013. ^ a b "Climate Normals for Dhahran". National Oceanic and Atmospheric Administration. Retrieved 1 February 2013. ^ Samenow, Jason (July 3, 2013). "Washington, D.C. can feel hotter than Death Valley at its hottest". The Washington Post. ^ "Climatological Information for Dhahran, Saudi Arabia". Hong Kong Observatory. Retrieved 1 February 2013. ^ "Why U.S. Military Bases Are Good for Mecca and Medina". Slate. 15 October 2001. ISSN 1091-2339. Retrieved 1 September 2017. ^ " Contact Us." Saudi Aramco. Retrieved 5 November 2009. ^ Some interesting oil industry statistics Gibson Consulting. Retrieved 20 January 2014. Wikimedia Commons has media related to Dhahran.